Before Pilates, I used to do high intensity exercises and on top of having constant back pain, also often sustained injuries. My muscles were also very tight and I had frequent cramps. Working in operations in a community hospital and surrounded by physiotherapist and occupational therapist, I knew I needed to strengthen my core muscle to avoid persistent lower back pain. I decided to give Pilates a try and ended up really liking it. My back pain improves when I do Pilates regularly and I do not get injured anymore! What was your first impression of Gyrotonic? I do both private and group Pilates classes. 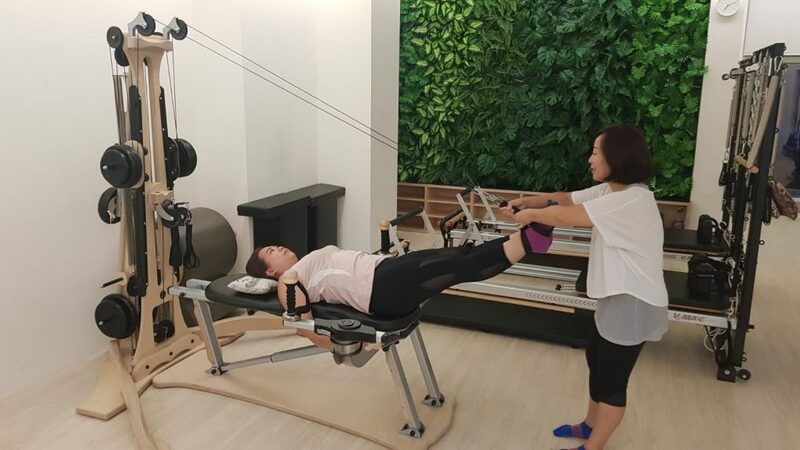 My private instructor told me to try out Gyrotonic, as I have always had tight muscle, and she thought that Gyrotonic may help me to improve my flexibility and mobility. My initial impression was that Gyro was easier than Pilates, which I have now realised is not true at all! What is your experience of Gyrotonic so far? After my first session, I felt my back loosen. I also realised that my coordination wasn’t very good! It has gotten better since the first session and Gyrotonic has definitely helped to improve my coordination. I am still working on my breathing techniques. The movements in Gyrotonic are more fluid and have more stretch as compared to Pilates. With each movement that I do, it loosens up my tight muscles and helps make me feel more relax. Cynthia, my Gyrotonic instructor, has been great at explaining the movments to me and guiding me throughout the session. How does it compare to Pilates? Pilates and Gyrotonic are good compliments to each other. Gyrotonic helps me to lengthen, stretch and move my muscle three dimensionally. Gyrotonic helps me to loosen up my muscles and increases my flexibility while Pilates helps to strengthen my core. Even after 3 years of Pilates, I am still constantly gaining more body awareness and am even more aware of my body posture now after Gyrotonic.